A holiday in Merano/Meran: Welcome to Lagundo/Algund! 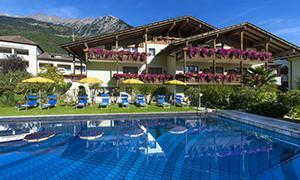 Making your holiday in Merano/Meran a special experience is our greatest heart’s desire. Art Residence Josefshof and Residence Steinach are situated in Lagundo/Algund, right next to Merano/Meran, at the base of the Texel Group. The family-run apartments in Lagundo/Algund in South TyrolLocation & Directions are ideal for a relaxing holiday as a couple or with the whole family in Merano/Meran. 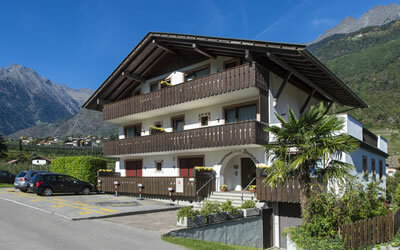 This apartment in South Tyrol has everything you could desire for your holiday in Merano/Meran. Residence Josefshof is situated in a quiet location and all the apartments are fully equipped. You can plan your holiday in Merano/Meran just how you want it to be. You have total freedom at the apartment in Merano/Meran. During your holiday in Merano/Meran you feel at home but even better. In good weather you can relax in the garden and sunbathe. To cool down simply jump into our outdoor pool, which is heated using solar energy. Even the little ones feel at home here. On holiday in Merano/Meran children have freedom and can let off steam outdoors surrounded by nature. And is there anything more wonderful than relaxation and adventure combined? 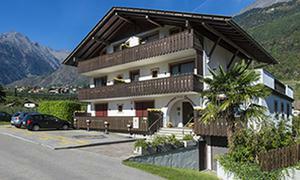 Just a few minutes away from Residence Josefshof is our other holiday apartment in South Tyrol, Residence Steinach. The residence is situated in a very quiet and sunny location surrounded by orchards and provides you with a relaxing time on your holiday in Merano/Meran. There is a garden and sunbathing lawn in front of the house, which is available to our guests. If you spend your summer holiday with us in Lagundo/Algund near Merano/Meran, you can also use the outdoor pool at Residence Josefshof free of charge. Besides Residence Josefshof and Residence Steinach we also own a pastry shop in South Tyrol. Konditorei Überbacher is situated in the centre of Lagundo/Algund and is a meeting place for young and old, guests and locals. We make gateaux, cakes, chocolates and even ice cream here with lots of love, everything home-made of course. We conjure up sweet specialities with a great deal of skill and passion. When you’re on holiday in Lagundo/Algund near Merano/Meran pop in and experience sweet indulgence at the Konditorei Überbacher. Holidaymakers at the Residence Josefshof and Residence Steinach in Merano/Meran receive a 10% discount off anything they eat or drink. Lagundo/Algund is two kilometres away from Merano/Meran. During your holiday you can reach the spa town easily by car in five minutes. If you want to go to Merano/Meran during your holiday but don’t want to take your car, it’s not a problem at all. Public buses run between Lagundo/Algund and Merano/Meran half-hourly on week days and hourly on Sundays and public holidays. If you have any questions or require more information then simply contact us, we will always be happy to assist you. You experience many cultural and culinary highlights on your holiday in Merano/Meran. 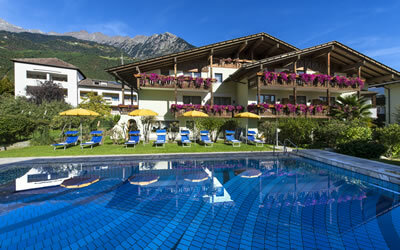 There are numerous Merano/Meransights and events that you can book in the spa town of Merano/Meran. Visit the Merano/Meran Kurhaus, walk along the Passirio/Passer river or visit an exciting horse race at Merano/Meran’s race course. What you definitely should not miss out during your holiday is a visit to a restaurant in Merano/Meran. Enjoy tasty South Tyrolean dishes and Mediterranean treats. Feel the exclusive ambience and experience South Tyrol in a unique way! Enjoy a relaxing time and experience thrilling moments with us in South Tyrol.